After four days of battle in the poker room of Aspers Casino, in Westfield Stratford City (London-UK), the World Poker Tour (WPT) National London has just been concluded with a poker lady scooping the top prize: Irina Nikolaidi. Irina is a highly skilled London-based poker enthusiast who clothed herself with determination to challenge a 667-player field in a £ 600 buy-in Main Event that saw some world-famed notables in contention, the likes of Tony Dunst, James Akenhead, Surinder Sunar, James Dempsey and Charles Chattha. Indeed, Irina has just entered the cicle of successful female poker players who delivered milestone performances in a global tournament. Recall that the recently-concluded World Series of Poker Championship saw another woman, Loni Harwood, grabbing the coveted trophy, a gold bracelet. Admittedly, the final table of this poker tournament was quite a hard-fought battle. The remaining pack included a panel of formidable tour regulars, namely Frances Pierre Canali and Julien Rouxel. Suffocated, the two men were respectively sent to 5th and 6th-place rail. It is still worth mentioning that the Accumulator format seduced numbers of regulars in this competition. Actually, each entrant was given the opportunity to add some chips to their stacks in the first starting day flight. 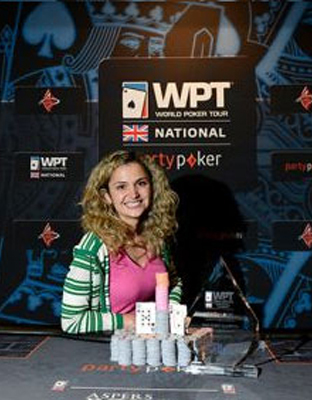 For her 1st-place finish, Irina Nikolaidi cashed $ 39,093 of prize. The 2nd-place finisher is another Londonian poker player, Simon Green. Finishing 3rd-place was Bobbie Brummitt. The other final-tablists are Vinny Anderson, Mats Rosen and Christy Kumar Anthony; they respectively finish7th, 8th and 9th place.